I’ve just returned from a little family trip to Florida. 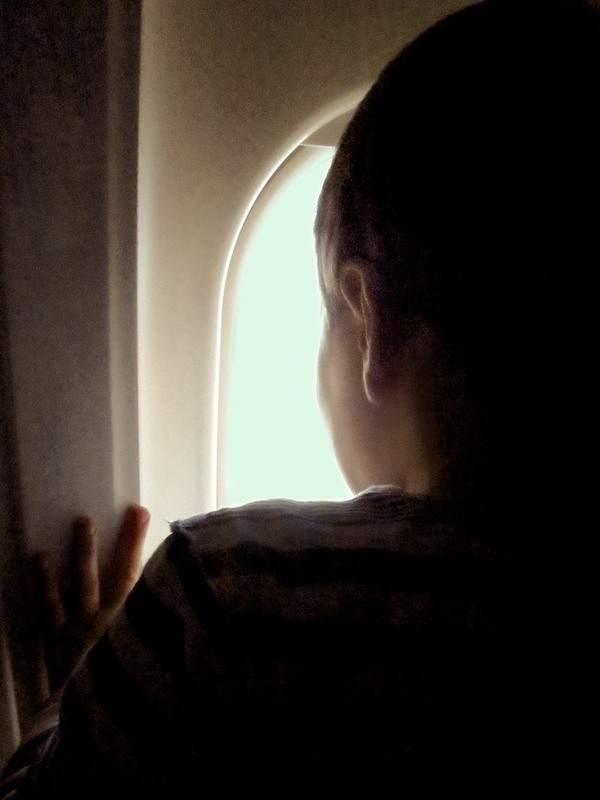 Of course, the big question was how my three year old was going to handle his JetBlue adventure to the Sunshine State. As it turned out, technology played a big role in his airborne experience. Our big mistake was giving him a little knapsack to carry, which housed a few precious toys. At the security gate, when it was time to place our carry-on bags through the X-ray machine, he immediately declined the opportunity to give his up. And finally, he demonstrated a finely executed wrestling maneuver, where he locked his mini sack into his tummy, hit the floor, and held on for dear life. Fortunately, two understanding TSA agents quickly came up with a solution. They offered to take our ‘situation’ into a little ‘room,’ escorted my son and wife in, and then reviewed each toy by hand. I’m told he sternly stood by with my wife while his ‘Kitty’ and ‘Blue Bunny’ were caringly given the official once over. Ten minutes later, we were on our way to the gate… my son’s knapsack repacked and attached to his back. “That was hard,” he whispered. When we arrived at the gate, JetBlue had a little kiosk where they were selling headsets for the flight. My wife and I knew about the little video screens on the back of each JetBlue seat and had made our peace about allowing him to channel surf (an activity he’s totally unfamiliar with) as a way to get through the three-hour flight. Now don’t get me wrong… we limited his channel selection between Cartoon Network and Nickelodeon. But there was still plenty of surfing! So we needed to get him a pair of headphones. But I wondered how good could a $2 headset be? Then again, how good did it really need to be? Still, I ran down to the nearest shop to see what they were selling. One swanky headset was going for $20. An even cooler-looking pair could be mine for only $59. Headphones have been around forever! You can probably find them today at the bottom of a cereal box. They shouldn’t cost more than… a couple bucks. So I went back to the gate and handed over two singles. And they even possessed the normal mini-plug for universal use. Shortly after we settled into our seats on the plane, my son became immediately fascinated by the built-in monitor in front of him. After he fastened his own seat belt, (four times) he quickly figured out how to operate the channel selector on the seat arm. Then, he came to a disturbing realization. This little TV had no audio. It was time to improve on my 0-1 batting average for the day. So after the thrill of takeoff, I pulled out the headsets and introduced them to him. He promptly plugged in and slipped them onto his head. And then he held them in place with both hands for the next three hours as he totally embodied the definition of couch potato. One might debate our parental decision on how we focused our son’s attention for those few hours. That said… our flight was dream. So, we were back in our seats, and I found an open moment to furiously check some iPhone emails before receiving the lights-out signal from the crew. As I studied my in-box, a stewardess’ voice flooded the aisle. I deepened my concentration in an attempt to slow down the space/time continuum, and I lost my ability to decipher outside audio detail. It all became a blurred muffle. Her otherwise friendly speech degraded into the teacher’s voice in a Charlie Brown cartoon. When the announcement ended, I noticed that something felt different around the cabin. I missed this pivotal ‘PED’ moment in consumer tech history, because I was checking my email?! I sat there with my glowing iPhone, almost stunned, not knowing what to do with my newly found freedom. FAA’s Halloween announcement allowing the expanded use of PEDs on flights. On November 1, they became the first US airlines to take advantage of the new rules. Actually, JetBlue claims to be the very first, but apparently it was a photo finish. Where Were You when PEDs were Freed? Apparently, dangerous interference from active PEDs doesn’t actually exist. And it doesn’t threaten an airplane’s navigation instruments on takeoff and landing. But you still can’t make a phone call during the flight. And you’ve still got to stow your laptop during takeoff and landings. As I think about it now, the Lester family was actually mid-air to Florida while all of this history was going down. One day, I’ll tell my son that he had actually participated in one of JetBlue’s last flights operating under the old draconian PED restrictions. …and do a little web surfing. Amazon had just cut a deal with the state of Connecticut to start charging sales tax for Connecticut shoppers. My gut reaction was to feel both patriotic and rebellious simultaneously. The Marketplace Fairness Act may be stuck in Congress, but some states have taken matters into their own hands to get their piece of Amazon’s revenue. And with my wallet suddenly feeling 6.35% lighter, I decided to put my iPhone back in my pocket and get my head out of the clouds. Instead it was time to marvel at some real clouds with my son. I turned to him, but his eyes were already glued to the video monitor. I pointed out our window to break the multimedia trance.